Marshall Auto Body is proud to announce its partnership with Tesla Motors Company as the only authorized Tesla Motors repair facility in Wisconsin and the first of four shops in the United States invited to participate in a two week certification program by Tesla Motors at the Palo Alto, California facility. Marshall Auto Body has been working with aluminum for over 25 years. With a background in light aircraft refinishing and sub assembly repairs as well as aluminum sheet metal work, we are well positioned and experienced in working with light weight automotive aluminum body panels and structure. We use the same Fronius cold metal transfer welder that Tesla’s are built with and have 200 hours of factory training in aluminum structural/mechanical repair and welding at Tesla’s Fremont, CA facility. Our Project managers and estimators are ASE Certified Master Technicians, a rare qualification in the body shop industry. 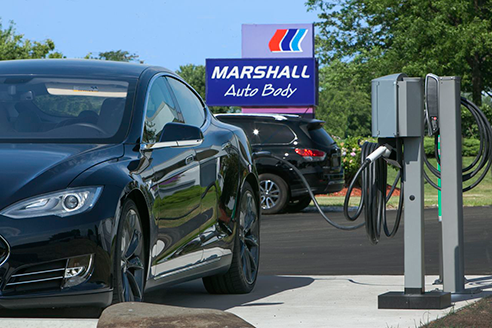 Marshall Auto Body, founded in 1978, has earned the I-CAR Gold Class Professionals designation every year since 1991 and has maintained the I-CAR Gold Class Professional status ever since. We are one of the few collision repair facilities in North America that have qualified as I-CAR Gold Class Professionals for over 23 consecutive years. Aaron Marshall (left) and his father Scott Marshall are excited to be involved with Tesla and Car Bench, because they covet the car and the equipment, respectively. Our solar powered Tesla HPWC and Clipper Creek CS-100 is available 24/7 at our outdoor parking area at no cost to EV owners. The Clipper Creek CS-100 charger requires an access code. The current code 3040 8265# expires 10/19/2014. Both chargers are FREE. We appreciate if you have the time ( while charging) to leave feedback or post a picture at Google +, Plugshare or Carstations. -Thanks!